Election season is here in the US, and we couldn't think of a better time to hold a political viz contest. As you might expect, you can create any visualization about any subject that is political (that's a pretty broad net). 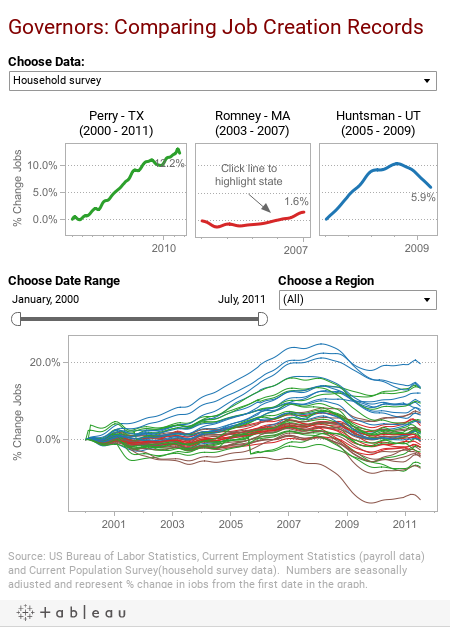 Don't want to create a viz about the elections? No problem - as long as the viz is political in nature it can win. Once you make your viz, make sure to submit it on the contest website and our judges will then determine the winner. First prize is a trip to the 2012 Tableau Customer Conference to compete in the Iron Viz Championship! What's the Iron Viz Championship? Quite simply, it is the premier visualization competition on the planet! Last year, David Newman, Alex Kerin and Steve Wexler (the winners of our 3 contests) competed at the Encore in Las Vegas in front of a live audience. It was close, but in the end Steve walked away with the win, $2,000 and an iPad. If you win the political viz contest, that could be you. Just like last year, there will be three contests leading up to the Iron Viz. However, this year residents from France, the UK and Germany can also enter. Stuck on where to begin? Sometimes it helps to have a little bit of inspiration. This viz was created before one of the GOP debates to see which of the potential candidates had a better job creation record. Just like this viz, it isn't necessary that your data be strictly political (polls, elections and law making) - it need only be relevant to something political. Like jobs, for instance. So what are you waiting for? Check out the details and start your viz today! Dude i think there is an error in the HTML somewhere? I can't load the page properly !